Paris Site Furnishings’ Verve benches and litter and recycling receptacles feature warm contemporary styling and maintenance-free design. 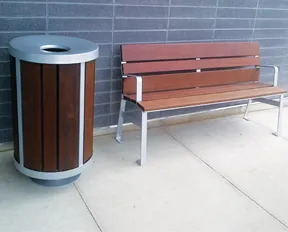 Constructed of aluminum and Ipe hardwood, the 20-gallon waste containers are available as single, standalone units or as tandems for waste and recycling receptacles. They include built-in anchor holes for secure mounting to a solid surface like concrete, or an optional surface mount pedestal. Aluminum components available in standard colors including red, blue, white, grey, green, yellow, and beige. When paired with stylish and comfortable 6-foot Verve benches, these site furnishings provide years of trouble-free service for any indoor or outdoor environment. Princeton, Ontario, Canada, N0J 1V0.